Rangeland managers and livestock producers need more timely and consistent tools that produce information to inform grazing strategies, risk management, and allotment management plans. On the ground monitoring is extremely expensive and is therefore difficult to employ consistently limited resources, fewer trained staff and shifting priorities. In addition, National Forest systems are now in various stages of Forest Plan Revisions which require assessments of current rangeland conditions and past vegetation performance in a clear, unbiased manner. In response to this need, Matt Reeves, with the Rocky Mountain Research Station, in partnership with private industry, has developed several new data services freely available to all stakeholders and managers. Specifically, we have developed the Rangeland Production Monitoring Service (RPMS) which consists of 2 components. 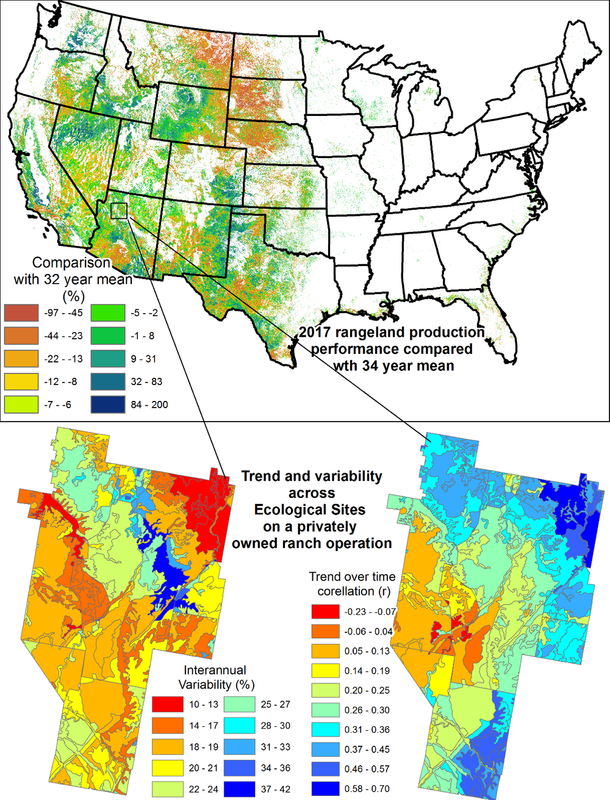 First, it includes a retrospective dataset with the objective of mapping and quantifying annual production of all 662 million acres of coterminous US rangelands from 1984 to present. To create this dataset we leveraged the Thematic Mapper data suite warehoused on Google Earth Engine and generated Normalized Difference Vegetation Index (NDVI). These originally data are offered at 30 m spatial resolution and to reduce processing constraints and file size (to greatly enhance download capability) the final product is resampled to 250 m. These data were converted to annual production by processing them through the Rangeland Vegetation Simulator (RVS) (Link to the PDF). The RVS is a simulation system that enables quantification of 1, 10, 100, 1000 hour fuels, standing carbon in shrubs, annual production of herbs, stems per acre, and vegetation response to fire and herbivory. Importantly this new simulation program was used to calibrate the NDVI to annual production. This unprecedented time series enables users of this service to quantify trends in production through time, evaluate inter-annual variability, and quantify recovery from drought and wildfire. This type of information has long been the target of many producers and managers so our development of this innovative service is timely and needed to aid efforts aimed at increasing resiliency and creating better grazing management strategies which can improve economic and ecological resiliency alike. The second component of the RPMS is a forage projection system that utilizes machine learning to process near real time climate and remote sensing data to estimate the magnitude and timing of annual production across all rangelands in the Northern Region of the USDA, US Forest Service (Region 1). This automated projection system operates between March and July of the growing season and is updated every 2 weeks allowing a new estimate of the total annual yield is made in concert with an estimate of the timing of the peak of the growing season. To ensure full disclosure and transparency we also offer a 95% prediction Interval about the estimate. These data are complementary to the GrassCast offered at: http://grasscast.agsci.colostate.edu/. How can these data help me? What is the impact of prairie dogs? How has land use effected regional production? How have range recovery efforts changed production? Quantify the effect of drought at various levels. Are there tipping points? How can I access these data? There are three options for accessing the rangeland production data availed by the RPMS. 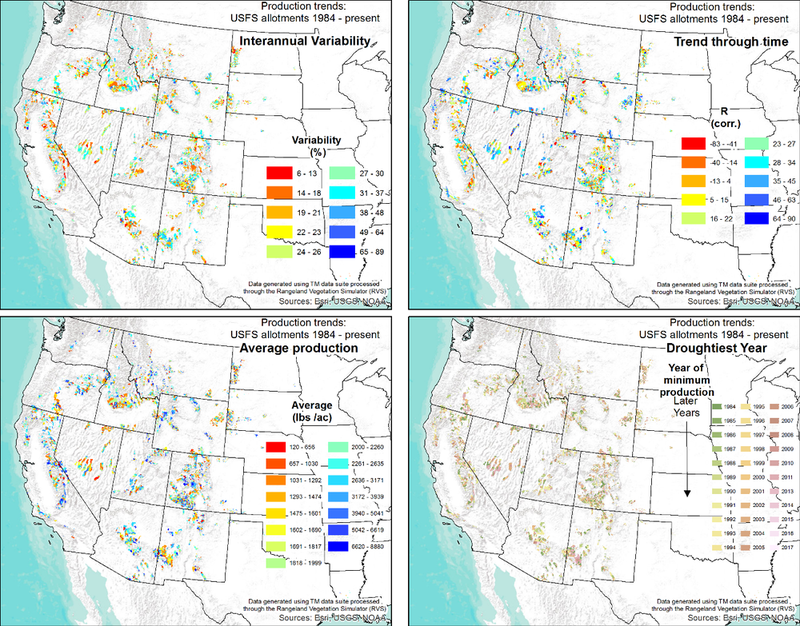 With the data access tool any user-defined geography (pastures, allotments, National Forests, private parcels, BLM lands, USFS lands etc) can be used to derive annual production estimates for any rangelands in the coterminous US. There are many uses of these data addressing wildlife habitat concerns, enterprise management, insurance underwriting, restoration planning, and allotment management planning. Here we provide 3 examples. In this example, four metrics have been produced across all grazing allotments in the western US from the RPMS including; A) inter-annual variability (as a percent of the 34 year mean), B) correlation through time (r; correlation coefficient), C) Average production values (lbs ac-1), and D) The least productive (usually the driest) year on record. As can be seen, in a matter of a few minutes, using the RPMS can enable a good understanding of conditions that are unfolding across all allotments, which is important information to improve allotment management strategies. In this example, by calculating trend, variability, least productive year and average production, we were able to quickly identify important trends unfolding across the extent of BLM rangelands. In this case we can see the Cuate Canyon allotment has been losing production at a significant rate since 1984, with an estimated lower end of about 450 pounds per acre. In this final example, the RPMS was used to update Ecological Site information for a ranch in Northern Arizona. Again, with just a glance, the RPMS enables determination of which sites are undergoing the greatest amount of change. In addition, since the RPMS covers all 662 million acres of rangelands it can also be used to compare between years to understand just how deep the drought impacts have been for a given region. For example, see the significant declines in eastern Montana in 2017. This was a very difficult time for producers and mangers throughout region where annual production fell between 40 and 97 percent compared with the 34 year average. Currently, the RPMS projections use three datasets as inputs. We’d like to thank the creators of these datasets for maintaining and hosting them. M. Hobbins, A. Wood, D. McEvoy, J. Huntington, C. Morton, M. Anderson, and C. Hain (June 2016): The Evaporative Demand Drought Index: Part I – Linking Drought Evolution to Variations in Evaporative Demand. J. Hydrometeor., 17(6),1745-1761, doi:10.1175/JHM-D-15-0121.1. D. J. McEvoy, J. L. Huntington, M. T. Hobbins, A. Wood, C. Morton, M. Anderson, and C. Hain (June 2016): The Evaporative Demand Drought Index: Part II – CONUS-wide Assessment Against Common Drought Indicators. J. Hydrometeor., 17(6), 1763-1779, doi:10.1175/JHM-D-15-0122.1. Abatzoglou, J. T. (2013), Development of gridded surface meteorological data for ecological applications and modelling. Int. J. Climatol., 33: 121–131.